The Blue Army (Polish: Błękitna Armia), or Haller's Army was a Polish military contingent created in France during the latter stages of World War I. The name came from the French-issued blue military uniforms worn by the soldiers. The symbolic term used to describe the troops was subsequently adopted by General Józef Haller von Hallenburg himself to represent all newly organized Polish Legions fighting in western Europe. The army was formed on 4 June 1917, and was made up of Polish volunteers serving alongside allied forces in France during World War I. After fighting on the Western Front, the army was transferred to Poland where it joined other Polish military formations fighting for the return of Poland's independence. The Blue Army played a pivotal role in ensuring Polish victory in the Polish–Ukrainian War, and later Haller's troops subsequently took part in Poland's defeat of the advancing Bolshevik forces in the Polish–Soviet War. Throughout the fighting on the Ukrainian front, soldiers within the ranks of the Blue Army assaulted segments of the local Jewish residents, assuming that some Jews were co-operating with Poland's enemies. Starting in 1914, the Polish community in North America began to organize in hopes of setting up a military organization with an end-goal of an independent Poland. In late 1914 a delegation was sent by the Polish-American group PCKR (Polski Centralny Komitet Ratunkowy / Polish Central Relief Committee) to Canada in hopes of setting up a Polish unit there made up of North Americans of Polish ancestry, they were rebuffed by the Canadian government. As the war dragged on they tried again and found a supporter in Quebec industrialist William Evan Price. With his contacts the Polish delegation met Sam Hughes, the Canadian Minister of Militia and Defence, and pitched a "Polish Legion of Canada" composed of three battalions. This time there was considerable interest and the Canadians sought and were given permission by British high command to start setting up a Polish Army Camp in Niagara-on-the-Lake. With permission granted the Polish army-in-exile called its camp "Camp Tadeusz Kosciuszko", honouring Tadeusz Kościuszko (a Polish patriot who led the 1794 Kościuszko Uprising aimed at freeing the country from Imperial Russia and the Kingdom of Prussia). Over 20,000 men trained in Canada, equipped and paid by France. Yet even though the camp was in Canada and supported financially by the French, the Americans viewed it as a threat to their neutrality. The emergence of the Blue Army was closely associated with the American entry into World War I in April, 1917. A month earlier, Ignacy Jan Paderewski submitted a proposal to U.S. House of Representatives to accept Polish-American volunteers for service on the Western Front in the name of Poland's independence. Some 24,000 Poles were taken in (out of 38,000 who applied) and after a brief military training, they were sent to France to join General Haller, including many women volunteers (PSK). Polish-Americans were eager to fight for freedom and the American-style democracy because they themselves escaped persecution by the empires who partitioned Poland a century earlier. 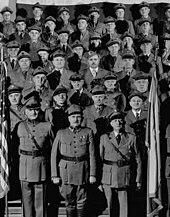 When the war erupted, the American Polonia created the Polish Central Relief Committee to help with the war effort, although ethnically Polish volunteers arrived in France from all Polish diasporas at the same time numbering over 90,000 soldiers eventually. The Entente responded in kind by recognizing the Polish National Committee formed in France (led by Dmowski) as Poland's interim government, with Wilson's written promise (issued on 8 January 1918) to recreate a sovereign Polish state after their victory. Poland's long-term occupier, Tsarist Russia, got out of the war, overrun by the Bolsheviks who signed a treaty in Brest-Litovsk on 3 March 1918, which was voided after Imperial Germany was overthrown in November 1918 and the successor revolutionary government surrendered in the 11 November 1918 armistice. The Blue Army was formally merged into the Polish Army after the Armistice between the Allies and Germany. Meanwhile, three interim Polish governments emerged independently of one another. A socialist government led by Daszyński was formed in Lublin. The National Committee emerged in Kraków. Daszyński (lacking support) decided to join forces with Piłsudski who was just released by the Germans from Magdeburg. On 16 November 1918, Poland declared independence. A decree defining the new republic was issued in Warsaw on 22 November 1918. A month later, Paderewski joined in from France. At about the same time, heavily armed Ukrainians from the Sitchovi Stril'ci (Sich Riflemen) seized the city of Lemberg, and the battle for the control of the city erupted against Piłsudski's legionaries. It was a high-stakes gamble with all sides attempting to establish a new regime ahead of the European peace conference in Versailles of January 1919. Similar Polish uprisings erupted in Poznań on 27 December 1918, Upper Silesia in August 1919 then again in 1920 and May 1921 — separated by the ad-hoc (or outright illegitimate) plebiscites with trainloads of German agents acting as local inhabitants. In the spring of 1919, the Blue Army (no longer needed in the West) was transported to Poland by train. The German forces were very slow to withdraw. In all, some 2,100 soldiers of the Blue Army who enlisted in France from the Polish diasporas died in the fighting, including over 50 officers serving with Haller. Over 1,600 men were wounded. Haller's army included 25,000 ethnic Poles drafted against their will by the German and Austrian armies, out of 50,000 conscripts from across partitioned Poland. They joined Haller from the POW camps in Italy in 1919. The final borders of Poland were set only in October, 1921 by the League of Nations. The first divisions were formed after the official signing of a 1917 alliance by French President Raymond Poincaré and the Polish statesman Ignacy Jan Paderewski. The majority of the recruits, approximately 35,000 of them, were either Poles serving in the French Army or former captured Polish prisoners of war, who were conscripted and forced to serve in the German Heer and Austrian Imperial-Royal Landwehr armies. Many other Poles also joined from all over the world—these units included recruits from the United States with an additional 23,000 Polish-American volunteers and former troops of the Russian Expeditionary Force in France. Members of the Polish diaspora community in Brazil joined the army with more than 300 men volunteering as well. The Blue Army was initially placed under direct French military control and commanded by General Louis Archinard. However, on 23 February 1918, political and military sovereignty was granted to the Polish National Committee and soon thereafter the army was directly commanded by independent Polish authorities. Also, more units were formed, most notably the 4th and 5th Rifle Divisions in Russia. On 28 September 1919, Russian government officials formally signed an agreement with the Entente that officially recognized the Polish military units in France as "the only independent, allied and co-belligerent Polish army". On 4 October 1918, the National Committee appointed General Józef Haller von Hallenburg as chief commander of the Polish Legions in France. The first unit to enter combat on the Western Front was the 1st Rifle Regiment (1 Pułk Strzelców Polskich) fighting from July 1918 in Champagne and the Vosges mountains. By October, the entire 1st Rifle Division had joined the campaign around the area of Rambervillers and Raon-l'Étape. The army continued to gather new recruits after the end of World War I. Many of these new volunteers were ethnic Poles who were conscripted into the German, Austrian and Russian armies, and later discharged following the signing of the armistice agreement on 11 November 1918. By early 1919, the Blue Army numbered 68,500 men and was fully equipped by the French government. After being denied permission by German officials to enter Poland via the Baltic port city of Danzig (Gdańsk) transportation was arranged via rail. Between April and June of that year, all the army units were moved to a newly independent Poland, across Germany in sealed train cars. Weapons were secured in separate compartments and kept under guard to appease German concerns about a foreign army traversing its territory. Immediately after its arrival, the divisions were integrated into the regular Polish Army and sent to the front lines to fight in the Polish–Ukrainian War, which was being contested in eastern Galicia. The perilous journey from France (through revolutionary Germany) to Poland in the spring of 1919 was documented by those who lived through it. Captain Stanisław I. Nastal: Preparations for the departure lasted for some time. The question of transit became a difficult and complicated problem. Finally after a long wait a decision was made and officially agreed upon between the Allies and Germany. The first transports with the Blue Army set out in the first half of April, 1919. Train after train tore along though Germany to the homeland, to Poland. Major Stefan Wyczółkowski: On 15 April 1919 the regiment began its trip to Poland from the Bayon railroad station in four transports, via Mainz, Erfurt, Leipzig, Kalisz, and Warsaw, and arrived in Poland, where it was quartered in individual battalions; in Chełm 1st Battalion, supernumerary company and command of the regiment; 3rd Battalion in Kowel; and the 2nd Battalion in Wlodzimierz. Major Stanisław Bobrowski: On 13 April 1919 the regiment set out across Germany for Poland, to reinforce other units of the Polish army being created in the homeland amid battle, shielding with their youthful breasts the resurrected Poland. Major Jerzy Dąbrowski: Finally on 18 April 1919 the regiment's first transport set out for Poland. On 23 April 1919 the leading divisions of the 3rd Regiment of Polish Riflemen set foot on Polish soil, now free thanks to their own efforts. Lt. Wincenty Skarzyński: Weeks passed. April 1919 arrived – then plans were changed: it was decided irrevocably to transport our army to Gdańsk instead by trains, through Germany. Many officers came from Poland, among them Major Gorecki, to coordinate technical details with General Haller. Haller's troops changed the balance of power in Galicia and Volhynia. Their arrival allowed the Poles to repel the Ukrainians and establish a demarcation line at the river Zbruch on 14 May 1919. The Blue Army was equipped by the Western Allies, and supported by experienced French officers specifically ordered to fight against the Bolsheviks, but not the forces of the Western Ukrainian People's Republic. Despite the diplomatic conditions, the Poles dispatched Haller's Army against the Ukrainians first, instead of the Bolsheviks. The tactical initiative was done in order to break the stalemate in eastern Galicia. In response, the allies sent several telegrams ordering the Polish government to halt its offensive, as using the allied-equipped army against the Western Ukrainian People's Republic specifically contradicted the status of the French military advisors, but the demands were ignored. The offensive by the Blue Army succeeded in breaking the stalemate and brought about a collapse of the West Ukrainian army. In July 1919, after securing victory on the Ukrainian front, the Blue Army was transferred to the border with Germany in Silesia, where it prepared defensive positions against a possible German invasion of Poland from the west. During the Polish-Bolshevik War several Blue Army formations were merged with the regular Polish army, and jointed together to form the 49th Hutsul Rifle Regiment and 18th Infantry Division. Haller's well trained and highly motivated troops, as well as their British build Bristol F.2 reconnaissance planes, Italian made Ansaldo A.1 Balilla fighter planes and French FT-17 tanks, also played a significant role in the war. The Polish-American first engaged the Bolshevik forces near the town of Rivne (Równe in Polish) on 18 June 1919. After pushing the Bolsheviks east, the Blue Army advance halted and the troops engaged in small skirmishes until the end of the war. Haller's troops would try to entrap small units of Bolshevik soldiers as well as raid garrisons for food, ammunition and to spread panic amongst the enemy. The Blue Army's 15th Infantry Rifle Regiment formed a basis for the 49th Hutsul Rifle Regiment (part of the 11th Carpathian Infantry Division) after the end of World War I. During the Communist crackdown in Poland after World War II, most of the history related to the Polish-Soviet War and the Blue Army was censored, distorted and repressed by the Soviet authorities. Throughout the fighting on the Ukrainian front, soldiers within the ranks of the Blue Army assaulted segments of the local Jewish residents, assuming that some Jews were co-operating with Poland's enemies, In eastern Galicia this included combat against a Jewish battalion under the leadership of Solomon Leinberg, a part of the Ukrainian Galician Army. In Częstochowa on 27 May 1919, a soldier by the name of Stanisław Dziadecki who served in one of the Blue Army's rifle divisions was shot and wounded while on patrol. A Jewish tailor was suspected, and killed by civilians and Haller's soldiers on the street, after which Jewish homes and businesses were looted, by estimates between 5 and 10 Jews were killed, and a few dozen wounded. Pavel Korzec wrote that as the army traveled further east, some of Haller's soldiers, as a way to exact retribution, looted Jewish houses and engaged in other acts of violence. Willian Hagen described Haller's troops together with civilian mobs as assaulting Jewish policemen, beating worshipers and destroying Jewish prayer books after in synagogues in eastern Chełm. Sometimes Polish police and regular army soldiers were able to limit violence committed by Haller's troops. According to Howard Sachar, in the year and a half prior to the Blue Army's arrival, the total number of Jewish casualties in the region was between 400 and 500, with Haller's troops doubling this number. The Morgenthau Report estimated that the total number of Jews killed as a result of actions made by the Polish military (including the Blue Army) did not exceed 200–300. As a result of the Blue Army's activities, General Haller's visit to the United States was met with protests from American Jewish and Ukrainian communities. Tadeusz Piotrowski has written that far more Poles and Ukrainians in the region were killed than were Jews, and that in most cases it was impossible to disentangle gratuitous antisemitism from commonplace looting and brutality of the soldiery. Piotrowski wrote the application of the term "pogrom" in the accepted sense of the deliberate killing of Jewish civilians could not be applied to the great majority of the incidents which occurred. According to Alexander Prusin there were a number of causes for the anti-semitic acts of the Polish forces. Socioeconomic tensions regarding land reforms and conflation of Jews with the landed class led to the feelings of hostility. Also, the lack of appropriate government compensation to the Polish soldiers led to soldiers viewing the looting of Jews as partial re-compensation for their service. For soldiers from Western Poland who remembered how many Jews have previously collaborated with Germany during a recent Polish-German conflict in 1919, this allowed framing of anti-semitic attacks as retribution on enemies of the Polish nation. Further, for many Poles Jews were associated with Bolshevism, and the Endeks in particular promoted the stereotype of Jewish Bolshevism. Likewise, according to Joanna Michlic, some perpetrators of anti-Jewish violence legitimized their actions in the name of national self defense. Officers and soldiers in the Blue Army expressed these tendencies, and often treated all Jews as communists, despite the traditional religious character and political diversity of Jewish communities. Some of the more significant incidents of abuse were inflicted by the Polish-American volunteers. It is likely that the cultural shock of finding themselves confronted by a multitude of unfamiliar ethnic, political and religious groups that inhabited Western Ukraine led to a feeling of vulnerability, that in turn provoked the violent outbursts. Encyclopaedia Judaica writes that because of its French ties the Blue Army enjoyed independence from the main Polish command, and some of its soldiers exploited this when engaging in undisciplined action against Jewish communities in Galicia. After the war, the Polish-American volunteers who served within Haller's Army were not recognized as veterans by either the American or Polish governments. This led to friction between the Polish community in the United States and the Polish government, and resulted in the subsequent refusal by Polish-Americans to again help the Polish cause militarily. Despite instances of violence committed against segments of the local Jewish community by soldiers within the Blue Army, some Polish Jews enlisted and fought alongside ethnic Poles serving as soldiers, doctors and nurses. According to Edward Goldstein writing in The Galitzianer, on examining a list of 1,381 casualty names compiled by Paul Valasek, he identified 62 (or approximately 5%) Jewish sounding names in the list. Ludwik Marian Kaźmierczak, the paternal grandfather of the German chancellor Angela Merkel, and an ethnic Pole born in Posen (Poznań), German Empire served in the Blue Army. During World War I, he was drafted into the German Army in 1915 and fought on the western front. After being taken as a prisoner of war in France, he joined the Blue Army, and subsequently fought in the Polish-Ukrainian and Polish-Soviet wars. After ending his service Kaźmierczak immigrated back to Germany. Wikimedia Commons has media related to Blue Army (Poland). ^ a b Landau, Moshe. "Haller's Army". Encyclopedia Judaica. Archived from the original on 17 July 2011. Retrieved 5 October 2015. Haller's army ("Blue Army"), force of Polish volunteers organized in France during the last year of World War I, responsible for the murder of Jews and anti-Jewish pogroms in Galicia and the Ukraine... Attacks on individual Jews on the streets and highways, murderous pogroms on Jewish settlements, and deliberate provocative acts became commonplace. ^ a b Heiko Haumann (2002), A History of East European Jews. Central European University Press; pg. 215, via Google Books. Notes not included. ^ a b Carole Fink (2006), Defending the Rights of Others: The Great Powers, the Jews, and International Minority Protection, 1878–1938. Cambridge University Press; pg. 227, via Google Books. ^ a b c d Ember, Melvin; Ember, Carol R.; Skoggard, Ian, eds. (2004). Encyclopedia of Diasporas: Immigrant and Refugee Cultures Around the World. Volume I: Overviews and Topics; Volume II: Diaspora Communities. Springer Science & Business Media. p. 260. ISBN 978-0-306-48321-9. Retrieved 22 July 2017. ^ a b c d e Kochanski, Halik (2012). The Eagle Unbowed: Poland and the Poles in the Second World War. Harvard University Press. pp. 5–9. ISBN 978-0-674-06816-2. Retrieved 23 July 2017. ^ Anna D. Jaroszynska-Kirchmann (2013). Polish American Press, 1902–1969. Lexington Books. pp. 464–. ISBN 9780739188736. ^ a b c d e Reddaway, William Fiddian; Penson, J. H.; Halecki, O.; Dyboski, R., eds. (1971). The Cambridge History of Poland: From Augustus II to Pilsudski (1697–1935). Cambridge University Press Archive. p. 477. GGKEY:2G7C1LPZ3RN. ^ Subtelny, Orest (2000). Ukraine: A History. University of Toronto Press. p. 370. ISBN 978-0-8020-8390-6. Retrieved 23 July 2017. ^ "The Polish Army in France, Haller Army, Blue Army - Battles in France". www.hallersarmy.com. ^ The Ukrainian Quarterly. Ukrainian Congress Committee of America. 1987. ^ Marija Wakounig (28 November 2012). From Collective Memories to Intercultural Exchanges. LIT Verlag Münster. p. 196. ISBN 978-3-643-90287-0. ^ Howard M. Sachar. (2007). Dreamland: Europeans and Jews in the Aftermath of the Great War, Random House LLC: page 25. ^ "The Jews in Poland : official reports of the American and British Investigating Missions". Chicago : National Polish Committee of America. 8 October 2018 – via Internet Archive. ^ "General Haller's Visit to Boston Curtailed". Jewish Telegraphic Agency. 27 November 1923. Retrieved 22 July 2017. ^ "Bnai Brith of Boston Decry Reception to Haller". Jewish Telegraphic Agency. 13 November 1923. Retrieved 22 July 2017. ^ Tadeusz Piotrowski. (1998). Poland's Holocaust: Ethnic Strife, Collaboration with Occupying Forces and Genocide in the Second Republic, 1918–1947, McFarland: page 43. ^ Moshe Landau (2007). Encyclopedia Judaica. Macmillan Reference Detroit, USA. Volume 8. ^ a b c Goldstein, Edward. Jews in Haller's Army. The Galitzianer, the quarterly journal of Gesher Galicia, May 2002. ^ Getter, Norbert; Schall, Jakub; Schipper, Zygmunt (1939). Żydzi bojownicy o niepodległość Polski: 1918-1939 : reprint [Jewish fighters for the independence of Poland] (in Polish). Rada Ochrony Pamięci Walk i Męczeństwa. ISBN 9788391666333. ^ Potocki, Andrzej (2010). SŁOWNIK BIOGRAFICZNY Żydów z Podkarpackiego [A BIOGRAPHICAL DICTIONARY OF THE JEWS]. CARPATHIA. p. 74. ISBN 9788362076246. Biskupski, M. B. (1999). "Canada and the Creation of a Polish Army, 1914–1918". The Polish Review. 44 (3): 339–380. ISSN 2330-0841. JSTOR 25779141. LCCN 57034642. OCLC 260158745. Hapak, Joseph T. (1991). "Selective service and Polish Army recruitment during World War I". Journal of American Ethnic History. University of Illinois Press on behalf of the Immigration & Ethnic History Society. 10 (4): 38–60. ISSN 0278-5927. JSTOR 27500870. Hind, Andrew (27 January 2015). "Polish Patriots: in Niagara-on-the-Lake 1917-1918". Today Magazine. Retrieved 30 November 2017. Pliska, Stanley R. (1965). "The 'Polish-American Army' 1917–1921". The Polish Review. 10 (3): 46–59. ISSN 2330-0841. JSTOR 25776612. LCCN 57034642. OCLC 260158745. Ruskoski, David Thomas & First Advisor:Christine M. Skwiot - Co-Chair; Second Advisor: Gerald H. Davis - Co-Chair; Third Advisor: Hugh H. Hudson (28 July 2006). The Polish Army in France: Immigrants in America, World War I Volunteers in France, Defenders of the Recreated State in Poland (Thesis). Georgia State University. Retrieved 30 November 2017. This page was last edited on 20 April 2019, at 17:37 (UTC).